My Cuban Cigars - Our Polls Archive. What are your most important cigar accessories? How do you light your cigars? Do you share your cigars? No way, I enjoy my Havanas too much! Who's the one that introduced you to your first cigar? What famous cigar smoker (from the past or present) would you like to smoke your stogies with? How often do you buy cigars? What music do you prefer to listen while you are smoking? Do you have Christmas wish list this year? Of course and all my friends and family know it. Yes, and it consists of Cuban cigars. Do you want to fulfill it? Would you like to participate in cigar contests for some Holidays? Do you like to smoke cigars with ..
No one! I prefer to smoke in solitude. What do you do with a cigar when you spot white mold on it? Not a big deal. Wipe it off and smoke. Do you freeze your cigars? 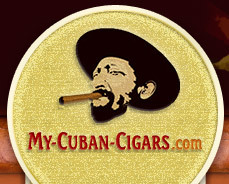 Why do you buy from My-Cuban-Cigars.Com? What's your favorite occupation while smoking a cigar? What would you prefer to get for Christmas? How much do you spend on cigars per year? 2 to 9 k USD. Nothing. Only get'em as presents. What do you think of cigar-smoking women? I am a woman and I smoke cigars. Does your wife support your smoking habit? Would you like our site to be redesigned? How do you store your stogies? Which Wrapper Shade You Prefer? How many cigars do you usually store at home? What's the maximum number of cigars you smoked during one day/night? Four-Five. I smoke in moderation. Only one cigar at a time. Six-Ten. I drink a great deal. I sleep a little, and I smoke cigar after cigar. That is why I am in two-hundred-percent form. More than ten. It has always been my rule never to smoke when asleep, and never to refrain when awake. What cigar would be the best Christmas gift? Why do you smoke cigars? Where do you prefer to smoke your cigar? What cigar strength do you prefer? Which taste type do you mostly appreciate in a cigar? Did The World Financial Crisis influence the amounts you spend on cigars? No, crisis can never make me spend less on cigars! What coffee brand origin do you prefer? What cutter type do you use? Which coffe type do you prefer with a fine cigar? What do you like to drink while smoking a cigar? How often do you smoke cigars? What is your favourite cigar size? Which cigar brand is your favorite?